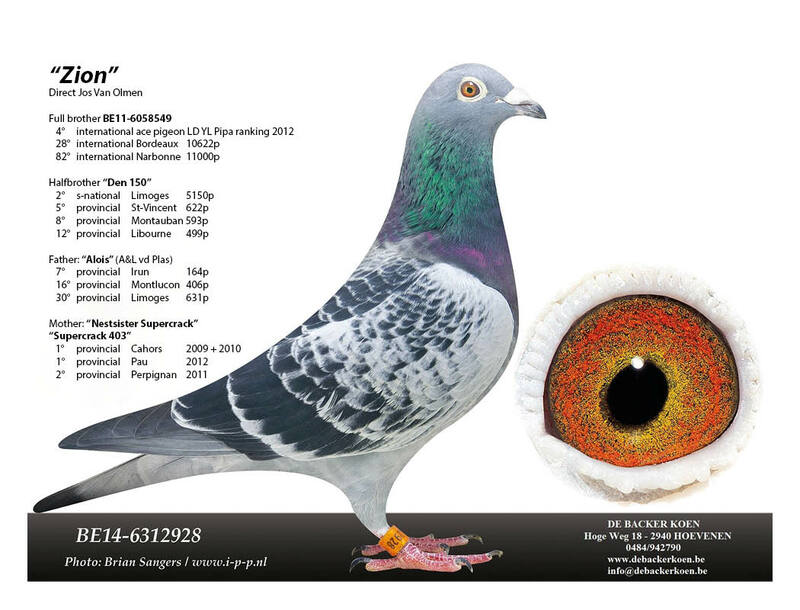 For the Jos Van Olmen strain, I was looking for the 2 basic pigeons in his loft, "Den Ezel" and especially "De 561". Both were full brothers, won TOP results, and did race kilometers like it was a piece of cake. 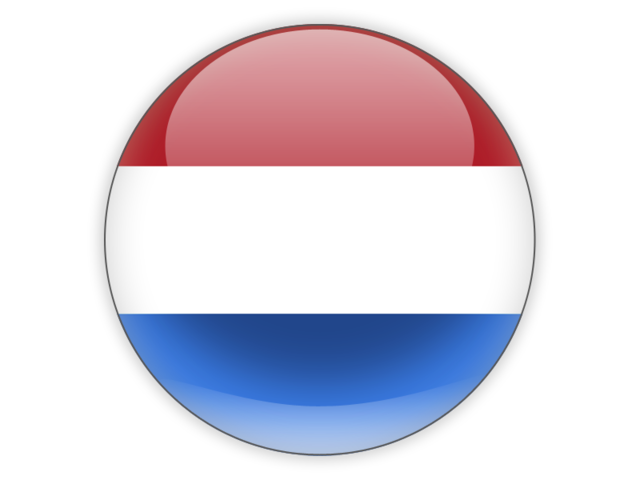 THE TOP RACER until 2013 in the Jos Van Olmen loft was 403-07, also known as "De Cahors" or "Supercrack 403". He was son of "de 561", and 403 won 3x 1st provincial, 2x on Cahors & 1x on Pau. He also wons 2nd provincial Perpignan and some other good prices. Begin 2013, 403-07 got injured on a training before season. Thats why Jos put him in the breeding loft. 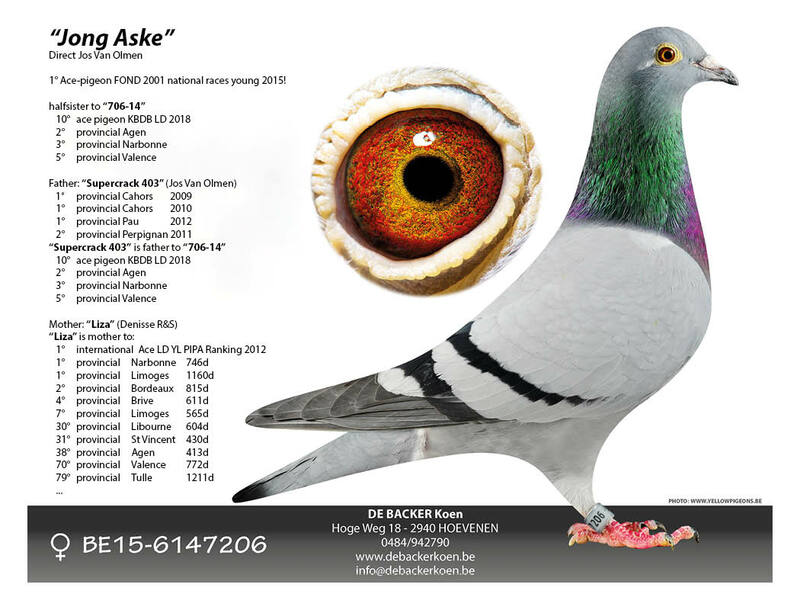 To give you an idea whats on my breeding loft in Hoevenen from Jos Van Olmen... some examples. Dochter van de 3-voudige provinciale winnaar van Jos. 1e provinciaal Perpignan x halfzus 3e internationaal Narbonne. Rechtstreeks Jos Van Olmen. Zoon van "Supercrack 403" drie keer 1e prov x "Liza" topkweekster! Rechtstreeks Jos Van Olmen. Dochter van "Supercrack 403" drie keer 1e prov x "Liza" topkweekster! 2 Daughters and 1 son "Supercrack 403"
150-10 is bred from "Nestsister Supercrack", 404-07. 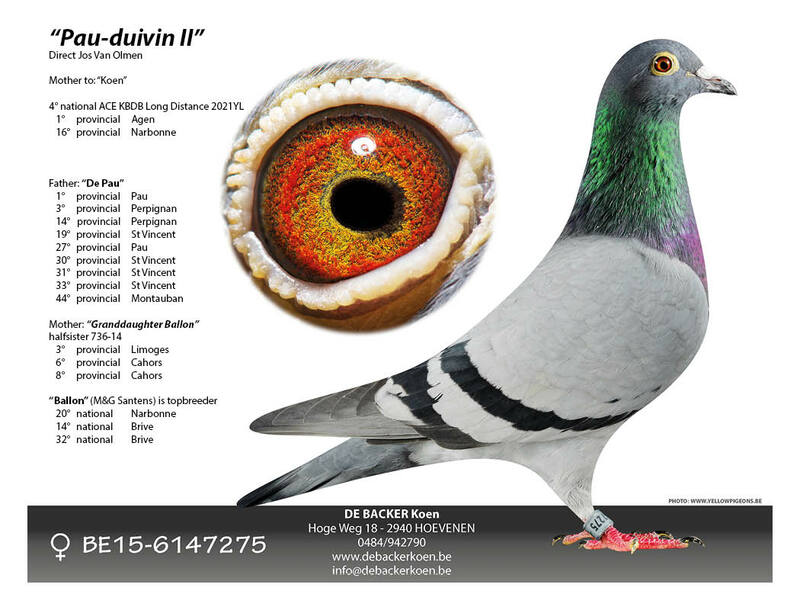 She's also mother to 549-11, 4th international ace pigeon long distance 2012! Son & 2 Daughters "De Pau"
"De 706" is a son to 403-07 "Supercrack 403"
He's from the good bloodlines as you can see. Bred from a granddaughter "De 561" paired to a daughter of "Liza from Stan & Ronny Denisse. 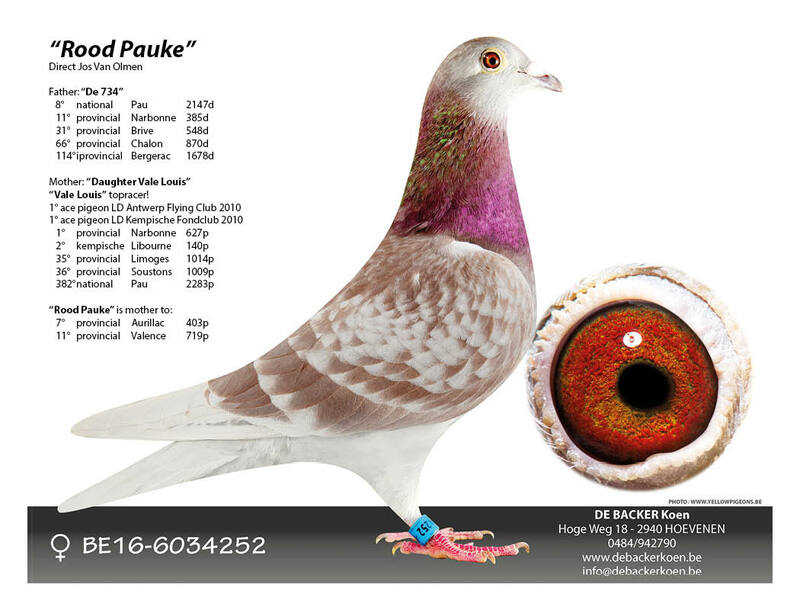 "Liza" is mother to "572-11", 1st international ace pigeon long distance YL PIPA ranking. New on the breeding loft in 2018 an 2019 are two sons of 404-07 "Nestzus Supercrack"
She's the nest sister of 403-07 with 3x 1st provincial & 1x 2nd provincial.